Cornell Engineering's experienced product developers and manufacturing specialists can work with you to optimize both the functionality and the ease of manufacturing of your designs. Our wide range of punch-presses, spot-welders and fabricating equipment allow us to manufacture a great variety of products. Our Unipunch Punching System allows for flexible and precise custom solutions to be manufactured quickly and cost-effectively. Custom enclosures are a specialty, both round and square. We can offer round enclosures in a variety of diameters and depths. Hard tooling can be developed for complex or high quantity parts. 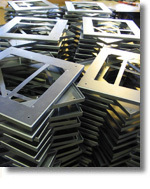 Parts can be finished to your specifications including plating, powder-coating and porcelain.